Eric Saltzman: Let	me	ask	– are	you	ready? ES: Help	me	understand	this	first. Tell	me	the	way	in	which	the	tribunal	can	grant	immunity	to	witnesses. Do	they,	how	do	they	choose	which	witnesses	will	have	immunity? Does	the	Prosecutor	apply	to	the	judges	for	immunity	from	prosecution	for	witnesses,	and	is	there	an	actual	immunity	agreement	written	so	they	understand	the	breadth	and	depth	of	the	immunity? I,	I,	I	don’t	think	that	we	have	in	fact	that	mechanism	in	place	whereby	a	witness	may	be	granted	immunity	here. The	only	rule	to	my	knowledge	we	have	is	–I’m	sure	you	know,	you	know	that	because	we	borrowed	it	from	your	system	– I	think	that	is	this	rule	against	selfincrimination. So,	that	is	what	we	have	in	our	rules. When,	for	example,	a	question	is	put	to	a	witness	and	then	in	answering	to	that	question	he	may	incriminate	hi-,	himself,	that	witness	may	be	advised	not	to	answer	that	question	or	if	forced	to	answer	that	question,	then	he	will	have	immunity. He	can	claim	immunity	when	forced	to	answer	a	question	knowing	that	his	respond	will	be	self-incriminating. That	is	the	only	extent	to	which	we	have	rule	about	immunity. But	now,	of	course,	the	prosecution	now	has	ample	discretion	and	he	has	in	the	past	use	that	discretion	to	enter	into	kind	of	bargain	with	witnesses. I	say	okay,	“This	is	what	I’m	prepared	to	do	if	you	accept	to	help	me	out,”	but	that	is	done	only	from	the	prosecution	perspective	without	any	involvement	whatsoever	from,	from	the	judges	or any	other	institution	of	the	tribunal. ES: And	what,	what	provision	do	you	have	for	that	witness	who	is	now	entering	into	a	situation	where	there	may	be	jeopardy	for	the	witness	. .	.
ES: . .	.	criminal	jeopardy? What,	what	accommodation	do	you	have,	do	you	have	for	that	witness	to	have	advice	of	counsel,	if	any? Yes,	in	fact	yeah,	that’s,	that's	also	a	tricky	question,	b-,	but	in	our	practice	it	only	arose	in	respect	to	– the	only	witnesses	who	come	to	court	with	counsel are	witnesses	who	are	already	accused	in	other	cases. Those	witness,	when	they	come	to	court,	they	have	their	counsel	sitting,	holding	what	we	call	here	a	watching	brief	and	if	need	be,	he	may	interject,	particularly	in	respect	of	that	sensitive	area	of	self-incriminating	evidence. But	for	ordinary	witnesses,	they	come	here	without	a	counsel,	so	meaning	that	everything	has	only	to	be	done	under	the	control	of	the	presiding	judge. That	will	be	up	to	him	to	evaluate	the	situation	and	allow	the	witness	to	respond	or	not	to	respond,	but	that	would	not	be	done	with	the	assistant	of,	of	counsel. ES: So	if,	if	I’m	a	witness	and	I	am	about	to	testify	in	an,	in	an	area	that	may	cause	me	to	incriminate	myself,	is	it	up	to	the	witness	to	understand	and	refuse? Does	the	judge	advise	the	witness,	and	if	the	judge	advises	the	witness	does	the	judge	make	clear	how	far	the	immunity	would	run? So	in	real,	in	real	life,	I	have	never	really	experienced	that	witness	and	it’s	a	very	tricky	question	in	a	sense	that	a	lay-,	a	layperson	may	not	be	even	understanding	all	those	intricacy. Of	course	I	would	understand	that	even	a	layperson	about	to	say	something	incriminating	would	know. And	in	fact	we	have	had	that	situation	many	times	because	for	the	last	five	or	seven	years,	many	witnesses	are	people	who	have	already	been	arrested	and	even	convicted	in	Rwanda. And	those	are	mainly	people	sometime	brought	by	the	prosecution	coming	here	to	testify	against	some	of	our	accused	as	even,	you	know,	accomplice	of	the, those	accused. "I	did	this	because	you	know,	this	accused	requested	me	to	do	that." But	of	course,	you	know,	in	that	situation,	this	precaution	on	self-in-,	-incrimination	do	not	arise	because	those	are	people	already	serving	sentence	in	Rwanda. And when	they,	they	come	here,	you	know	they	don’t	require	any	type	of	protection	whatsoever. 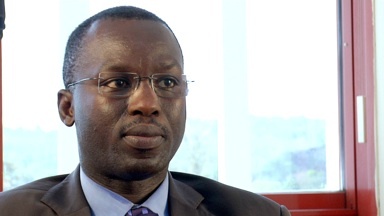 But	of	course	now,	one	of	the	problems	facing	the	defense	is	always	the,	the	level of	their	truthfulness;	whether	they	have	any	interest	particularly	in	Rwanda,	not	here, in	charging	their	client. Were	they	promised	anything? Those	are	area	sometime	visited	by	defense	counsel. But	that	question	never	really	arose	as	to	whether	they	require	protection	from	the	tribunal	because	most	of	those	people	are	already	undergoing	heavy	sentence	in	Rwanda. ES: That	surprises	me	because	as	we	know,	you,	you	only	prosecuted	so	many	people	. .	.
Yeah	. .	.	yes. ES: . .	.	but	there	must	be	so	many	other	participants	who	could	be	witnesses	who	may	be	subject	to	jeopardy	themselves. Yes,	yes,	but,	you	know,	the	way	I	have	experienced	it	is	just	the	way	I	explain	– people	already	sentenced	or	being	prosecuted	in,	and	detained	in	Rwanda	coming	here	being	very	forthcoming	in	every	detail	as	to	their	involvement,	but	not	seeking	any	protection	whatsoever. ES: Very	interesting. I’m	going	to	stop	myself. I’m	going	to	invite	Batya	to,	to,	to	jump	in	. .	.
ES: . .	.	but	you’ve	explained	a	lot	to	me. I	learned	a	lot. I	appreciate	it.